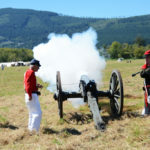 # 764 – Brass cannon firing. 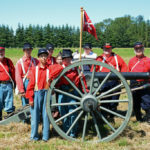 1st Illinois Light Artillery Regiment Battery “A” Morgan’s. 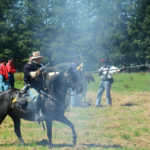 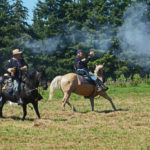 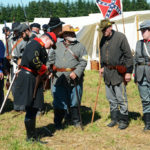 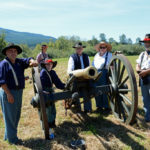 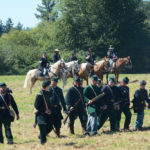 BATTLE OF SNOQUALMIE (U.S. Civil War re-enactment) 2016 AUGUST 13-14 at Snoqaulmie, Washington, USA. 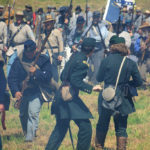 I enjoy military history and also taking action photos. 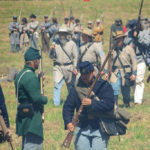 Civil War re-enactments cover both of those for me. 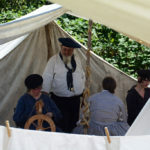 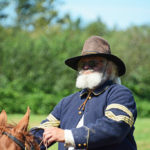 My wife and I attended this event in Sunday August 14 and found that all of the re-enactors were very friendly and hospitable. 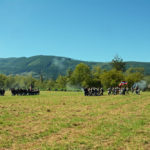 There was of course no real “Battle of Snoqualmie” as this was simply the available location for the event. 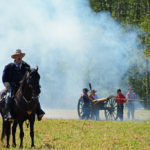 It was hot that day and one cannot help but admire the fortitude of the re-enactors dressed in woolen uniforms or hoop skirts. 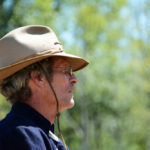 I took hundreds of photos and it will take me time to select, process, resize and caption the best images. 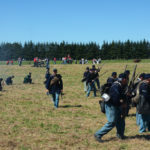 Images were taken in high resolution but are shown here at 1024 lower resolution which looks good on computers and is reasonably fast to load. 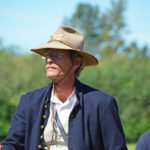 There are MANY more photos to come, so please do check back from time to time. 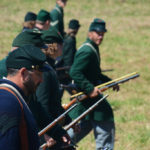 # 478 – Sharpshooter and skirmishers. 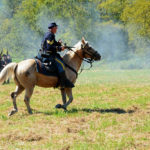 # 486 – Officer on horseback. 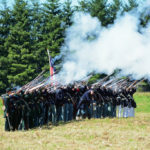 # 530 – Union volley. 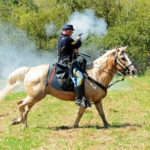 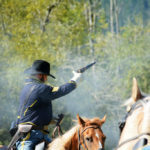 # 535 – Cavalry Sergeant on horseback, with pistol, eyeing the situation. 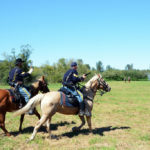 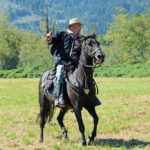 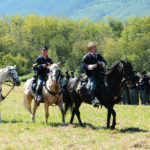 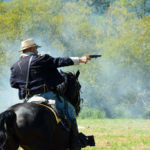 # 547 – Union Cavalry Sergeant races forward as part of a flanking harassment move. 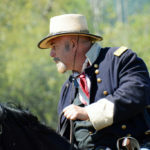 # 575 – “C’mon Bubba, we got to skedaddle! 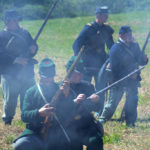 Them Yankee boys is a gittin too close fer comfort!” Rebels scrambling to get away from advancing Union skirmishers. 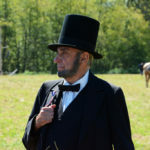 # 620 – The Commander-in-Chief, President Abraham Lincoln. 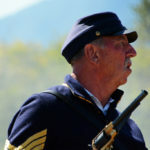 # 699 – The pause that refreshes. 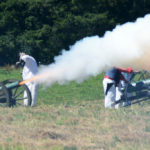 It was hot for the reeneactors. 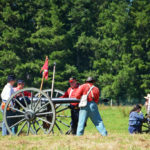 #709 – Union Gun crew – 1st Illinois Light Artillery Regiment Battery A Morgan’s. 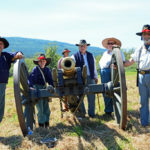 #716 – Union Gun crew – 1st Illinois Light Artillery Regiment Battery A Morgan’s. 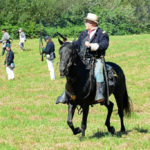 # 729 – Officer on horseback reviewing Union troops in camp before battle. 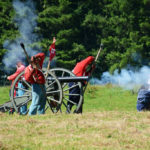 # 764 – Brass cannon firing. 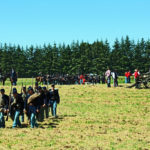 1st Illinois Light Artillery Regiment Battery A Morgan’s. 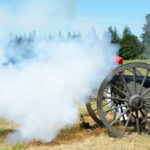 # 744 Small Union cannon firing. 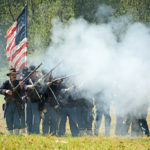 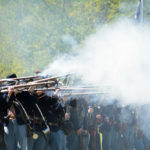 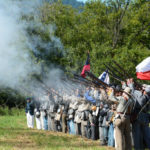 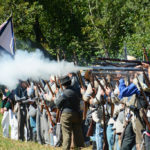 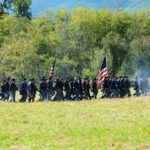 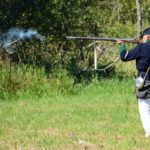 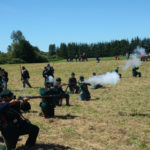 # 790 – Union troops move up past their guns. 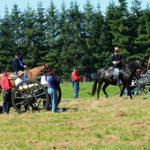 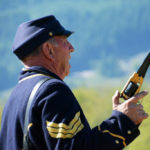 # 796 – Officer on hoseback advancing past a field gun that is being loaded. 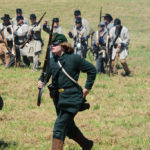 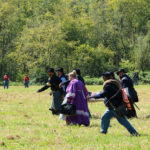 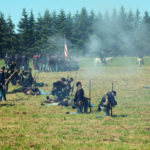 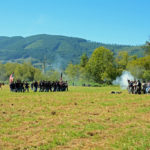 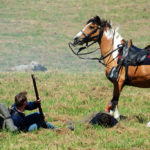 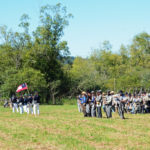 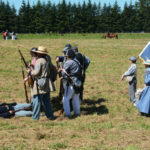 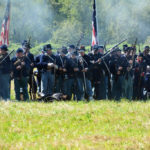 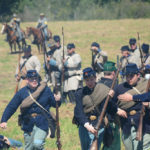 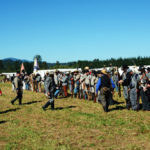 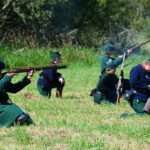 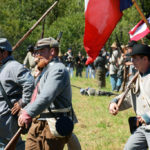 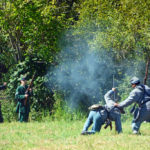 # 813 – Union skirmishers fall back as the Rebel infantry advances. 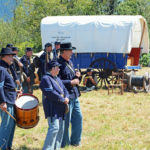 # 732 – Signals wagon in the union Camp. 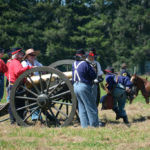 # 803 – Union cannon reloading. 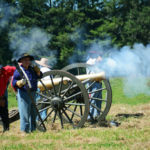 # 807 – Union cannon firing. 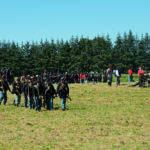 # 889 – Officers among the guns. 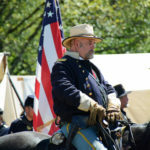 # 890 – Down but not out. 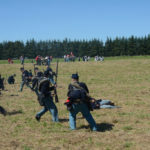 union casualties. 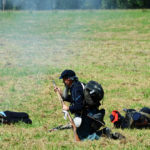 # 909 – Smoke and casualties among the Union troops. 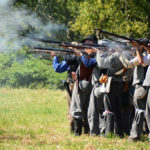 # 967 – Union troops emptying their firearms as a safety check at the end of the battle. 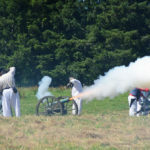 # 774 – Union small cannon’s muzzle flash. 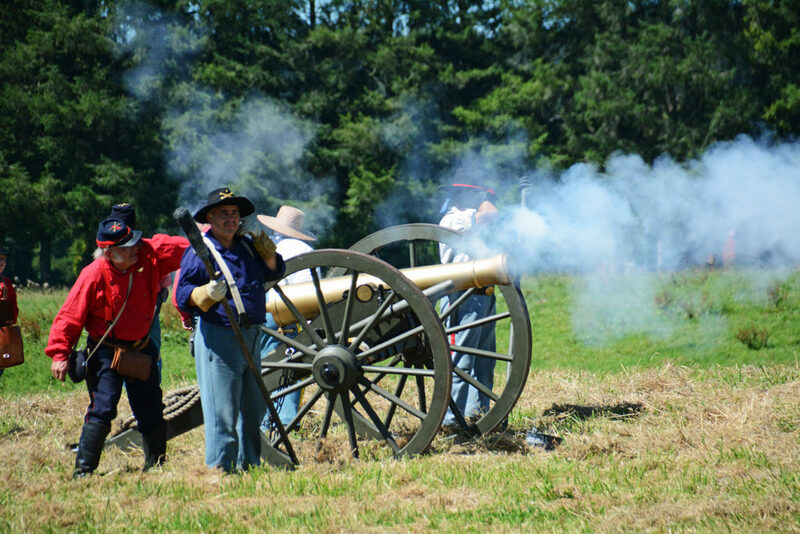 # 686 Confederate cannon fires upon the Union Camp in between battles. 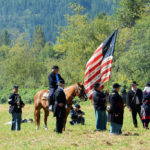 Snoqualmie, WA, USA 2016 AUG.
A full index of my web site’s pages is shown, usually on the left side of the page or at the bottom, depending upon the type of computer you are viewing it on.